Whenever I’m about to travel somewhere, I’m the kind of person that likes to do some research ahead of time. Just to get a feel for a city before I arrive, but not so much that there are no surprises left. Included in that would be my hotel accommodations. 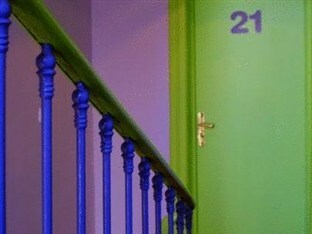 Except this time, for the first time in my life, I went on the recommendation of a two-star hotel through a friend who suggested and before I could even ask, booked a stay for me at the very gay-friendly H33 Hotel in Nice. I have been fortunate enough to stay at some amazing four and five-star hotels. And at times, depending on where I was going and my budget for the trip, I’ve stayed in more cost-effective two and three-star hotels without any problems. 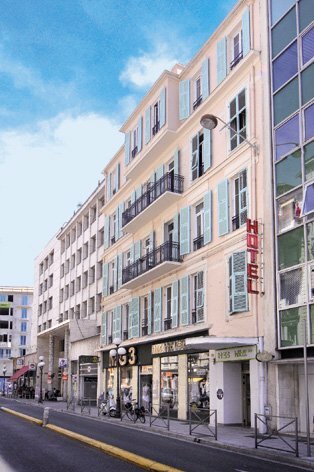 This time I purposely did not do any type of research besides get the address from my friend, so I wasn’t sure what to expect from the H33 Hotel in Nice. All I knew from the address was the hotel is situated in central Nice at: 33 rue Pastorelli. Which means it would be very easy to find since it’s only a couple of blocks from avenue Jean Médecin. And a leisurely walking distance to most everything one would want, including the beach. 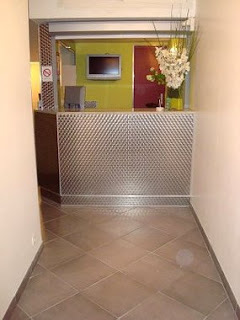 On arrival, my first impressions were how clean and organized the lobby and large stairwell area appeared to be. Especially since I had arrived close to noon and the staff was busy with hotel guests checking in and out. And even though the staff appeared run off their feet, they were very professional and acknowledged my presence. Within minutes I was registered into the hotel. Since my friend made the reservation, the type of room size I would have was also going to be a surprise. I was given my room key and told the room was on the top floor and cordially shown the elevator around the corner from the front desk. Once off the elevator I could see my room number on the door immediately at the top of the short flight of stairs. Entering the room I was instantly happy. I could not believe this was a two-star hotel! The room was the perfect size, no squeezing between furniture to get around. It was air-conditioned; there was a flat screen TV, and two separate, soundproof glass doorways that lead to a huge terrace with tables and chairs overlooking the city! It made every other two and three-star hotel I had stayed at before in my life feel like absolute rubbish, almost embarrassing when I really thought about it. This hotel was great; it should really be given a couple more stars! Exploring the room further, I noticed the bathroom looked recently renovated including a decent sized shower, with lots of comfy, thick towels and plenty of toiletries added in. 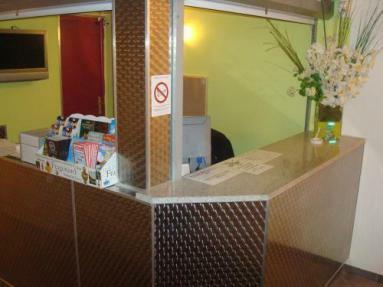 I had free Wi-Fi, a safety deposit box, a big double bed, with even a single bed across from it. The room was very clean and I could live with the bold statement made in the decor with the dashes of bright color here and there. Actually, if this was part of the hotel’s branding, it seemed well suited. Taking it all in, I swear, while unpacking I must’ve had the biggest smile on my face. I was already one happy and content hotel guest. It was also good to be able to relax on the terrace and take in the various, expansive views of Nice. I just could not get over size of this terrace, it easily would fit at least ten people, and when you consider its part of such a nice room, for the money, this is a fantastic deal. I remember contacting some friends on Facebook about the hotel room, noting that the terrace was so large I could have a party on it. Some of them thought I should but I knew how that would go and I wanted to respect the other hotel guests. For me, it was lovely enough just to unwind out on the terrace in the early evening and enjoy a glass of wine before going out for the night. At one point I even just sat out there while working on my laptop and felt warmly surrounded by the city that I love. It was all a pleasant experience. Add to that, I had some of the best nights sleeping in a hotel ever, the bed was comfortable and the room seemed so quiet. 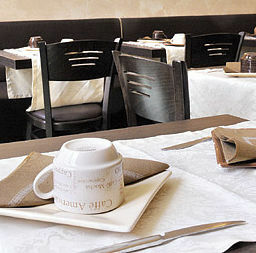 Between 7am and 11am there is a breakfast room just up a level from the main floor of the hotel. I was always on the go with meetings so unfortunately I didn’t have breakfast in there but in passing it did seem very popular with the other hotel guests. Overall, this is the first time I have ever been so impressed with what is regarded as being a two-star hotel. If you are traveling on a budget and want to feel confident that you are in a clean, comfortable and safe hotel, I highly recommend a visit to the H33 Hotel in Nice.